My BFF of 15 years is getting married in 2 weeks time so we, her bridesmaids, organised a bachelorette party for her to celebrate her last days of single-hood. 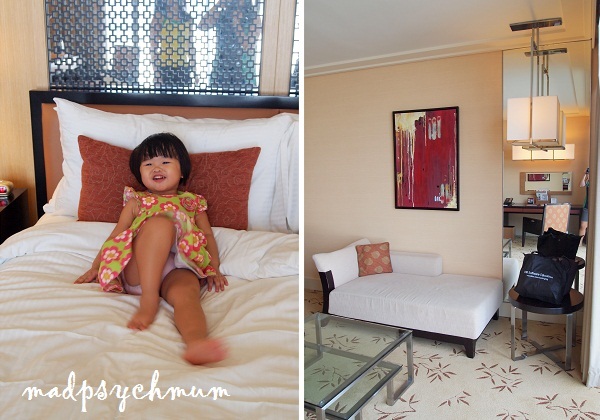 We were allowed to check-in earlier than the allocated time so it was off to check out our room on the 13th floor. I brought my girl along because I wanted her to go swimming in the Infinity Pool again since she enjoyed it so much the last time. As I was afraid that the good weather might change suddenly, I hurried everyone to change into their swim attire and head for the pool! As usual, we needed to take many lifts to reach the pool at the 57th floor and were greeted with the beautiful skyline of Singapore when we arrived. 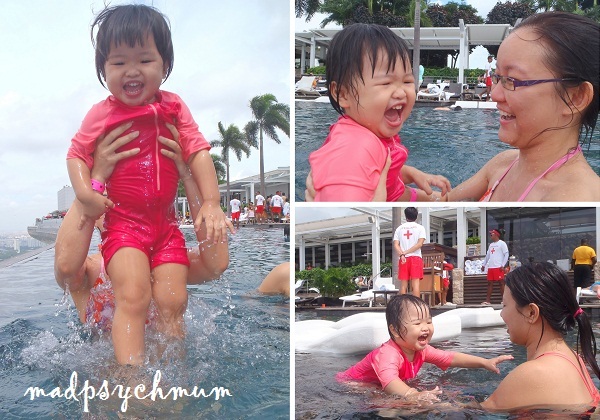 The moment baby girl saw the pool, she got really excited and was the first to jump right in! As you can see, baby girl was exhilarated! We were famished by the time we returned to our room so after a very relaxing and warm shower, we called for room service and paid for the most expensive plate of fries any of us had ever eaten. To be fair, the service was excellent, the fries crispy and warm as though it had just been fried outside our room and the ketchup came in the cutest bottle we have ever seen! We really enjoyed it very much, especially my girl, who kept taking more and more from the plate whenever I wasn't looking. 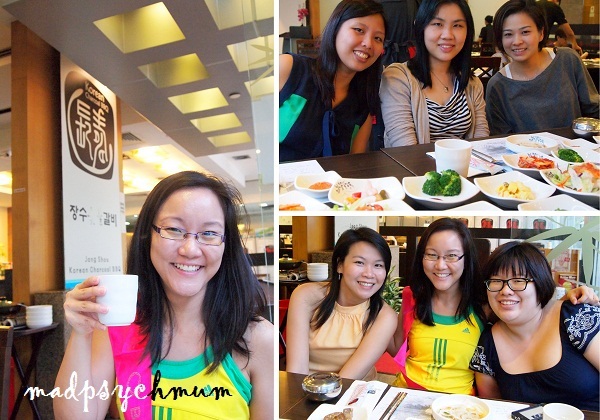 When we were all ready to head out, we decided to explore the newly opened Gardens By the Bay located just next to MBS. 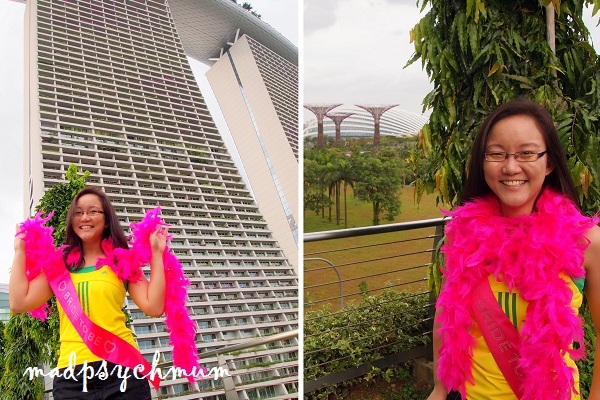 On the way there, we made our bride-to-be don on shocking pink feathers and a sash which she had to wear for the entire day! Girlee joined in the fun as well! After passing my girl to her daddy, we decided to take a slow walk to Esplanade for dinner. We had our dinner at a Korean Charcoal BBQ restaurant, which was recommended by the bride-to-be as a nice place for Korean food. We bought wine and snacks back and enjoyed the rest of the night in our hotel room, discussing how we were going to torture the groomsmen and gossiping till late into the night (well at least they did.. I was sound asleep by 1am! Shocking I know..).